Ward Village®, an urban master planned community under development by The Howard Hughes Corporation®, marked another major milestone today by breaking ground on Ae‘o, a 466 unit mixed-use residential tower that will be anchored by the highly anticipated flagship Whole Foods Market®. Designed by world renowned architectural firm Bohlin Cywinski Jackson in partnership with Architects Hawai‘i, Ae‘o’s façade will take on a dramatic sculptural form that echoes patterns of the wind. Along with Waiea and Anaha, Ae‘o will make up the first completed district of Ward Village that will be a dynamic addition to the Honolulu skyline. 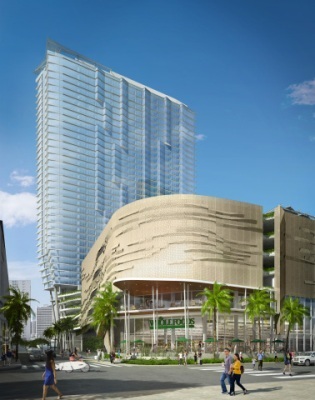 The flagship Whole Foods Market will further enhance the transformation of Ward Village into an environmentally sustainable, walkable community in the heart of Honolulu. The flagship location will support local farms and producers and will offer the best selection of quality local and superior organic products available. As Hawai‘i’s only LEED-ND Platinum-Certified development and the largest neighborhood in the country to receive such a prestigious certification, the core values of Ward Village and Whole Foods Market are well-aligned. Ae‘o’s convenient location will provide residents with easy access to Ala Moana Beach Park, the revitalized Kewalo Harbor, local boutiques, diverse eateries and the 16-screen movie theatre at Ward Entertainment Center. Given the direct access to Ward Village’s four-acre village green, Ae‘o presents an ideal residential environment for healthy and active living in urban Honolulu. With available prices starting in the $700,000s, Ae‘o will offer one-, two- and three-bedroom residences with stunning ocean and mountain views and ample parking to accommodate residents, shoppers and those visiting Ward Village. For more information on Ae‘o and Ward Village, visit www.aeowardvillage.com.